This post explains you about Ansible Vault. 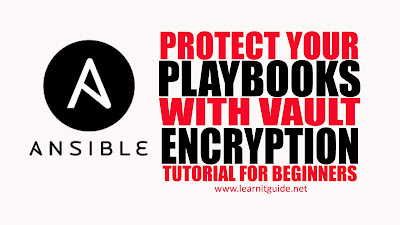 End of this document, you will be able to understand, what is ansible vault, how to encrypt the Ansible playbooks, how to decrypt it, how to view and edit if required, also will explain you how to reset a new Ansible vault password. 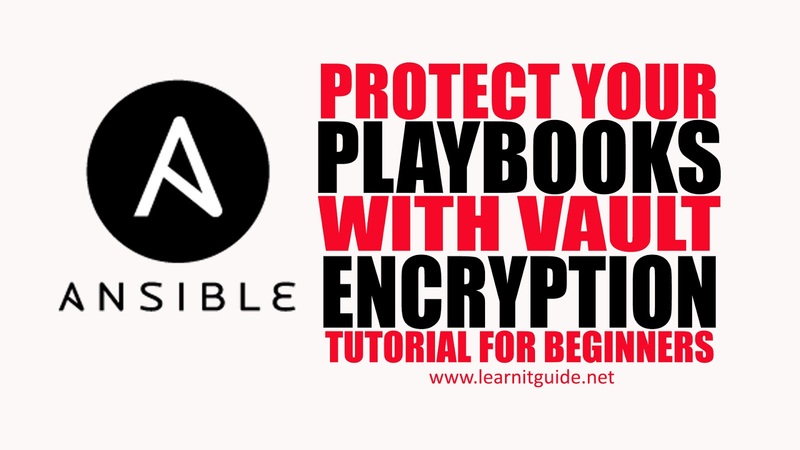 Ansible Vault is a feature of ansible which allow us to protect the sensitive data with encryption in a playbooks such as data files, usernames, passwords, configurations. If any ansible playbook is encrypted, even a ansible administrator cannot read a playbook with any editors without providing a valid vault password. Its not publicly visible. Lets take an example playbook. Also Watch this "Ansible Vault" Tutorial video demo on our YouTube Channel. Below ansible playbook is used for user creation which has Username, Password and Agreement to be copied to the home direcory are specified clearly. So anybody can view this information. content: "Its a Confidential Agreement between an Employee & Employer new\n"
Lets see how to encrypt with Ansible Vault to protect the sensitive data and see what is happening after encryption. Use the option "encrypt" along with ansible-vault command. Enter the vault password twice you wish to set for the particular playbook users.yml, this password is only for this file. Now, if anyone try to open the protected file with any normal editors, they cannot be readable by the users. because its encrypted. So Once any playbook is encrypted with ansible-vault command, you have to use the ansible vault command to manage the encrypted file as below. How to view the encrypted playbook file? Use the "view" option along with ansible-vault command and enter the vault password. How to edit the encrypted playbook file? Use the "edit" option along with ansible-vault command and enter the vault password. This will use your default editor set in your user environment. Once you have done the changes, save and exit from the file. How to run a encrypted ansible playbook file? If a playbook is encrypted, We cannot run a ansible-playbook as we do normally. Else you would get an error as below. Instead, we can use use the argument "--ask-vault-pass" to provide the vault password or Save your vault password in a file and call the vault password file using the argument "--vault-password-file". 1. Using the arguement "--ask-vault-pass"
Enter the vault password when it prompts to run the ansible playbook. 2. Using the arguement "--vault-password-file"
Before run, save your vault password in a file and run the playbook again. Vault password is stored in a file called vault-passwd. This time vault password will be taken from the file you have provided, hence it wont prompt you to enter the vault passwd. If you are not allowed to store the password in clear format, then use only "--ask-vault-pass" arguement. How to change the existing vault password? Use the "rekey" option along with ansible-vault command. Enter the old vault password and enter the new password twice. How to decrypt the protected ansible playbook file? Now the playbook is decrypted. Hope you have got an idea about Ansible vault to protect the sensitive data.